Shut up, I am not this old. I found myself speed reading through russian novels (which doesn’t work) and desperately trying to compile essays of meaningful content without a true grasp of the work. Unless you consider Cliff’s Notes legit. So I abandoned the dream of “I have a degree in suicides and socialists”. I found myself suckered in to one of those excrusiating elementary school activities designed to increase parental participation. Specifically, a “Book Club”. Yes, reading a book and then attending a discussion group. Ok, cute idea, encourages reading, count me in. It would have been more enjoyable had Holly not lost the book before I finished. Let me elaborate. Not only was the book missing in action, Holly chose to hide this fact until the night before, too late for me to do much about it. For almost two weeks I was fed “I forgot it” or “its in my desk” whenever I asked for the book. But I had decided not to make a mountain out of the molehill of a book I could finish in less than an hour. …. not taking into account I would at some point need the actual book itself. The skill that guided me through Brothers Karamazov was more than adequate to fake my way through “Frindle”. And if I learned nothing else working in a corporate bank, I learned the power of the leadership position. So much to Holly’s dismay, I volunteered to lead one of the groups. This put me in the position of being able to cut and paste together my answers from the responses of others. my answers were in the form of a sumation of the others, I came across as a literary genius, was able to make this elementary piece of fluff literature sound as if it had deeper undertones, and no one was the wiser. The moral of my story? Don’t mess with me, I took classes even I don’t understand and have at long last found a use for them ! 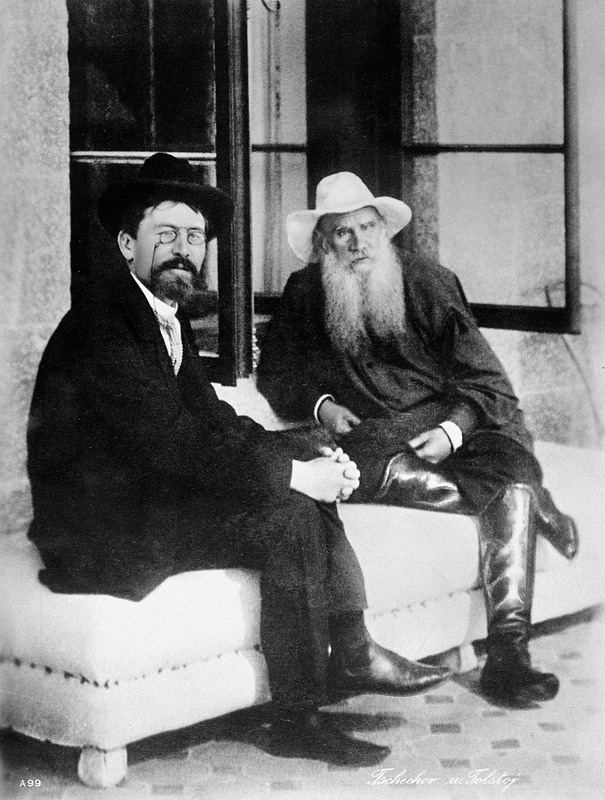 Chekhov assures Tolstoy their readers will surely benefit from their wisdom if they don’t freeze to death first. You never know when skills you once though were useless would come in handy. Who knows? You might even be able to use those Fortran skills someday. I’m sure someone has a pre-Atari computer or a floppy disk that may need code someday! That’s funny I was just writing about Fortran. Can’t remember much of it, but I took it and BAL too. You just never know when something you learned might come in handy. I’m still waiting – hah. I can remember my kids telling me the night before that they needed two dozen cupcakes or cookies and I’d be up until midnight making it happen. …I’m sure someday we’ll look back & laugh….someday …. Is it just me, or does it seem like everyone on WordPress majored in either Great Books, English, or literature? P.S. I’m having trouble with my reader so I’m missing a lot of post notifications. Would it be okay if I added you to my blogroll so that I don’t miss your posts? & yeh, I feel abit like a misfit in the college major area, but hoping some of it rubs off if I hang out here for long enough …. …but you keep me on my toes !